Taiaroa Head/Pukekura, at the end of the Otago Peninsula, is home to an impressive number and diversity of seabirds. 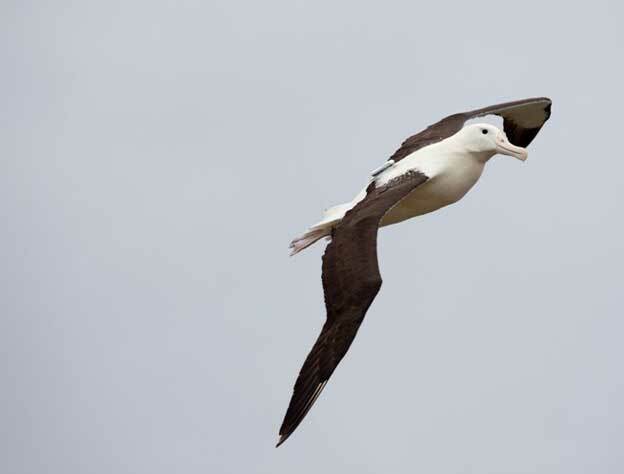 With nearly 10,000 birds, the area has significant populations of gulls, shags, penguins and shearwaters, but is most well known for the iconic albatross. Weighing 6-8 kg and with a 3 metre wingspan, the northern royal albatross are one of the largest of the albatross species. 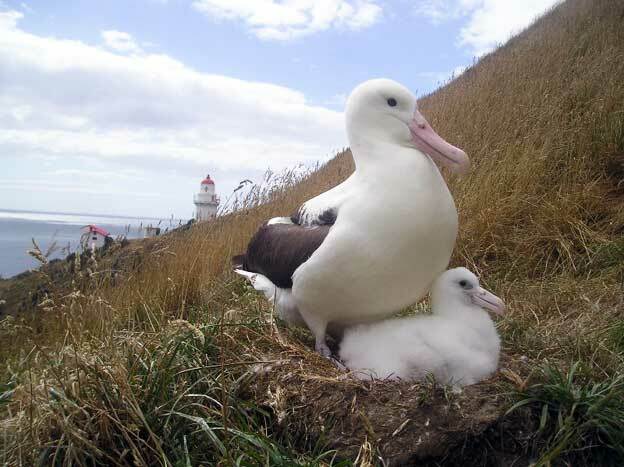 The small population at Taiaroa Head is significant as it is the only mainland breeding colony for any albatross species in the southern hemisphere. For the northern royal albatross, the beginning of autumn is the start of a phase we call ‘post guard’, where both parents forage at sea for food, leaving the chick alone for several days between meals. There are many questions about foraging adults that we would like to know the answer to: Are longer trips at sea more productive for the adults? 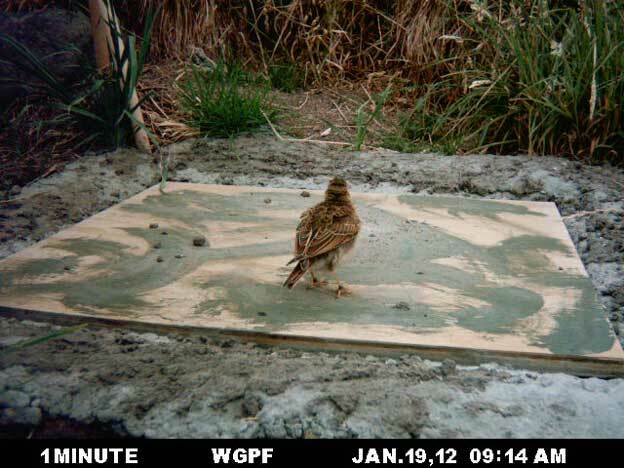 Do foraging areas used by males differ from females? Do the foraging areas change throughout the season? Junichi Sugishita, a PhD student with the University of Otago, is studying the foraging strategies of the breeding adults at Taiaroa Head and, for the first time, adult birds are being tracked during the post guard stage. 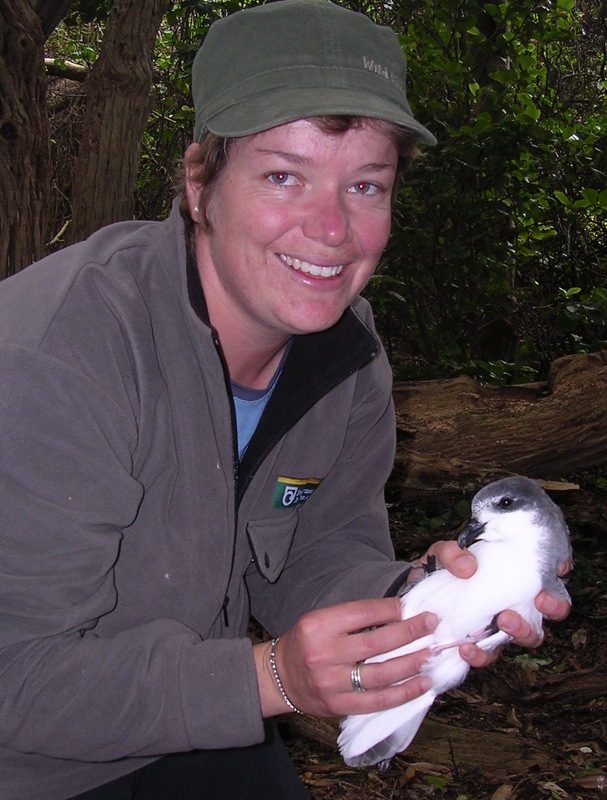 The research involves a number of devices situated on land at Taiaroa Head, and also attached to birds. 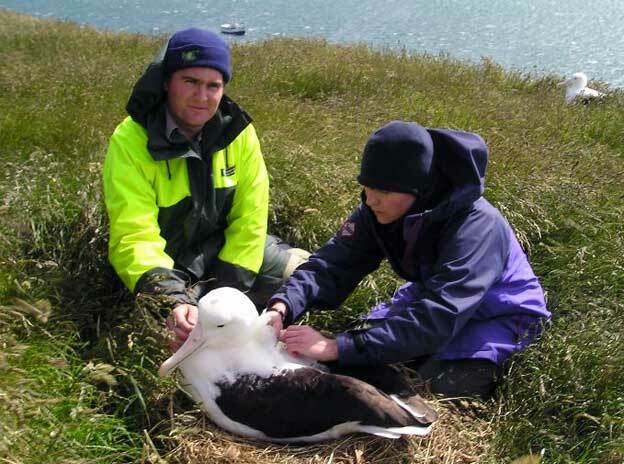 The rangers have a good working relationship with (most) of the albatross at Taiaroa Head, so we were able to attach GPS and radio transmitters to the back feathers of the adult birds without the need for restraint. The combined weight of these two units attached to the feathers is less than 0.6% of the adult’s normal body weight. 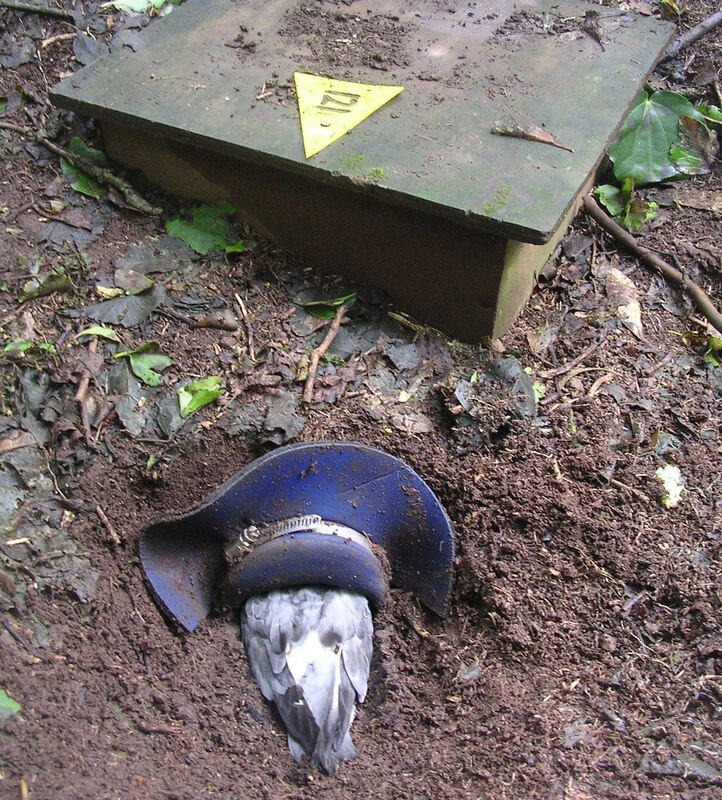 Weight platforms were also installed at selected nests. These platforms consist of electronic scales connected to a data logger situated under a plywood base. We had hoped to monitor changes in the weights of adults throughout the breeding season but the albatross had other ideas. During installation of the scales the birds on the nests showed absolutely no interest, with some adults even choosing to sleep throughout the installation process. However, when they returned from sea to change nest duty with their partner they reckoned there was something decidedly fishy about the platforms. They avoided standing on the scales by choosing an alternative access to their nest. We then thought we could dupe them by painting the plywood so that it blended in with the surroundings. However, they still weren’t convinced and continued to choose an alternative route into and out of the nest which avoided crossing the scales. Next we tried coercion by erecting a plastic mesh fence around the nest, so that the best option for access would involve walking over the scales. However, the albatross decided they would rather climb over the fence than cross those scary looking scales. We finally realised that the albatross would continue to outsmart us. We removed the fences and let them be. It was a gentle reminder to us that what we perceived as non invasive wasn’t considered so by the albatross! The royal albatross is a slow breeder, with only one chick raised every two years. Breeding takes a full year — from mating in October, to incubation of the egg from November to January, followed by nine months of feeding until the chick fledges in September. 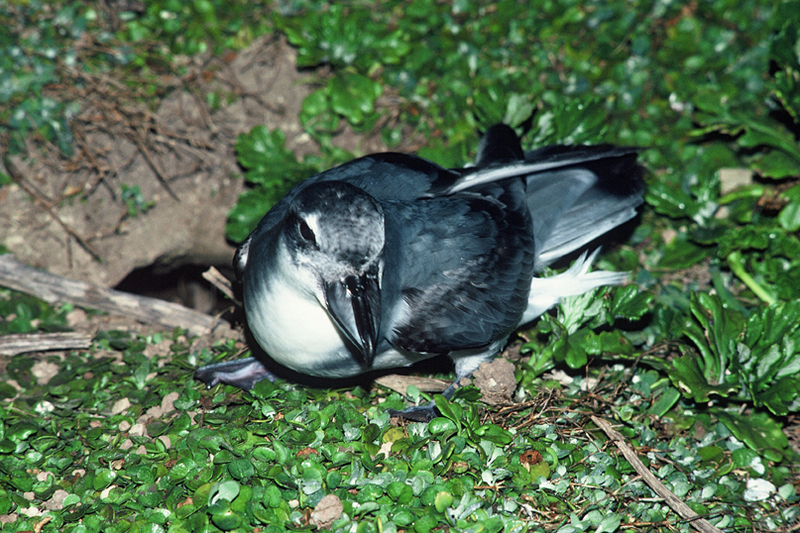 Chicks that fledge successfully won’t be seen on the headland again for another five years, when they return to find a mate — and they can be quite picky, taking 2–3 seasons to make a choice. They finally start to breed at around eight years old. It is this naturally slow breeding biology, coupled with complexities of life on a mainland site, that has restricted the population growth at Taiaroa Head which by 2011 was around 160 individuals. 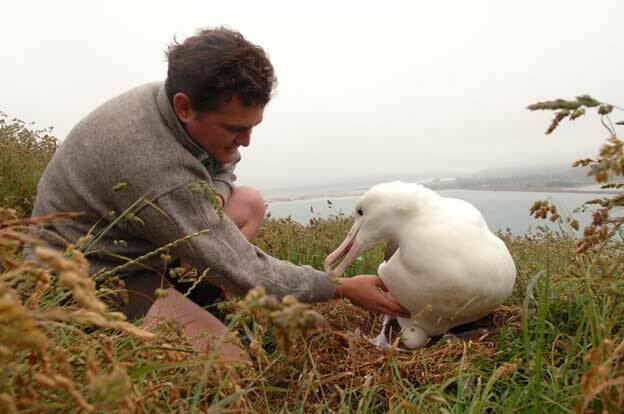 Over-handling and restraining of albatross can affect their behaviour and trust of people. As conservation managers we need to weigh up handling, research and manipulation against the negative effects on the bird and their breeding success. 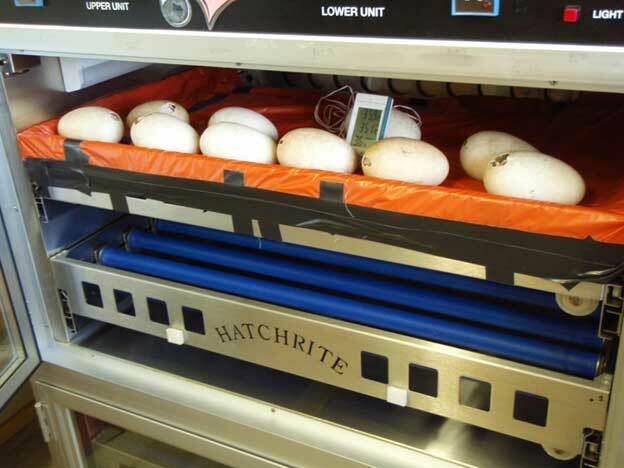 This is particularly important at Taiaroa Head as a huge part of management involves manipulation of eggs and chicks at the nest to achieve a high success rate. 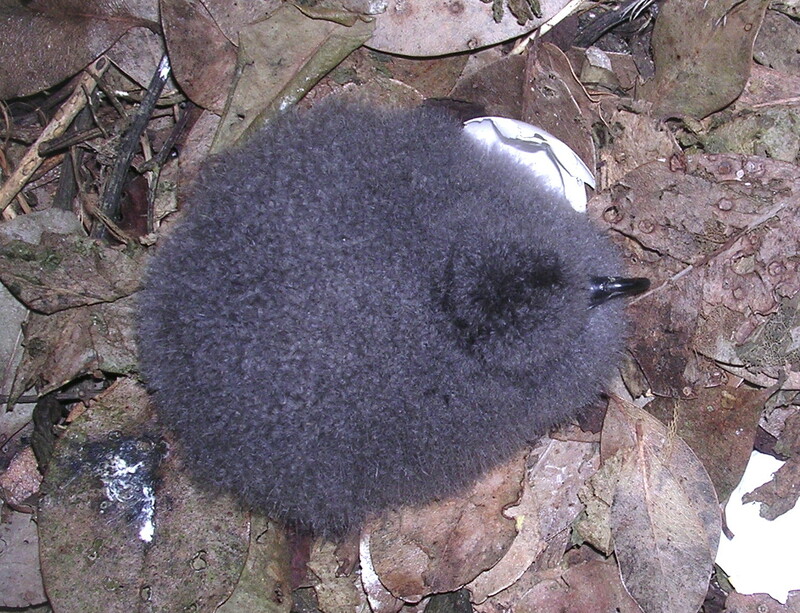 The success rates are due, in part, to having adult birds tolerant of staff while they inspect their egg or chick. One of the greatest threats to newly hatched chicks is fly strike. Flies can lay maggots directly onto the hatching egg. Of the 21 chicks hatched in the 2011/12 season, only one died and this was from fly strike. 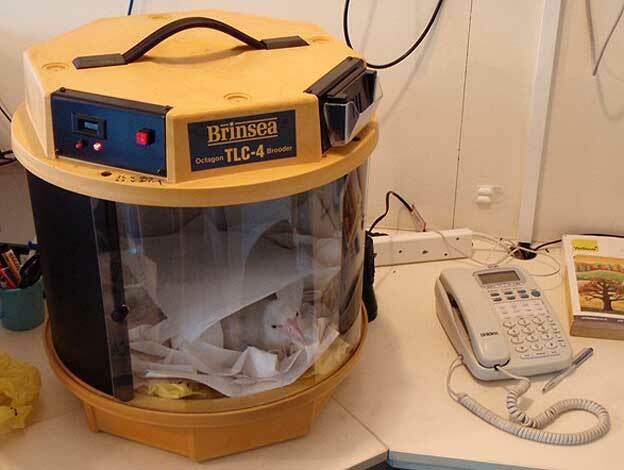 Our best protection against flies during this vulnerable time is to move the hatching eggs into an incubator during the day, returning them to the nest at night. Like most years, the hatching/guard stage this season hasn’t been without issue. Three chicks lost significant weight. This indicated a microbial infection in the gut, which a course of antibiotics fixed. All three chicks are now several weeks old and growing rapidly.